Astronomers had a problem: Something was wrong with the orbit of Uranus, the seventh planet from the sun. Then came the discovery of Neptune, the eighth planet. But something was still wrong with the orbit of Uranus. Could yet another planet lurk unseen in the distant reaches of the solar system, and could such a planet be affecting the orbit of Uranus? The first part of the question was answered in 1930, when Clyde Tombaugh, an Illinois farmboy with a high school education and a burning interest in astronomy, discovered a tiny planet after examining hundreds of thousands of heavenly objects on photographic plates. Named Pluto, the planet Tombaugh discovered has revealed itself with great reluctance. It took fifty years for astronomers to measure Pluto’s diameter with some degree of accuracy, yet even today no two figures are quite the same. It took as long for Pluto’s moon Charon to be discovered. Yet some astronomers question whether Charon is even a moon, believing it instead to be a double-planet system with Pluto. The second part of the question asked above has not been answered to astronomers’ satisfaction. Pluto, it turns out, does not influence the orbit of Uranus the way it should, so some astronomers are once again looking for another planet, a tenth planet far, far away in the distant reaches of the solar system. What will turn up is, at this point, anybody’s guess. There is a good chance, however, that anything that does turn up may be unexpected, like Charon and Pluto were. And, of course, the unexpected may not turn up for years. Or you never know. It could turn up tomorrow. 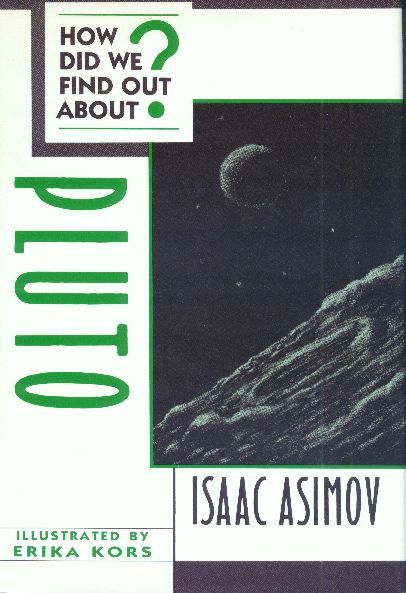 Although this book is aimed at virtually the same audience as the slightly earlier Pluto: A Double Planet?, it is less detailed, less extensively illustrated, and less useful as a reference book on the planet. It’s still excellent for the target audience, but is not quite as useful perhaps for the adult who wants to do some quick checking on main facts regarding the (erstwhile) ninth planet in the solar system.